Minimum requirements are based on USFS Rules, but the team may set requirements that differ. Star Lit Blades Coaches retain the right to make exceptions and decisions based on what they feel is best for a team and the program as a whole. If you have questions or concerns on your skaters placement, level, age, or team, please contact a coach PRIOR to tryouts. All decisions made after tryouts are final and will be left up to the coaches discretion. 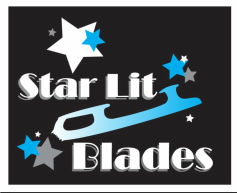 NOT ALL TEAM LEVELS WILL BE OFFERED THROUGH THE STAR LIT BLADES PROGRAM. TEAMS WILL BE MADE BASED ON LEVEL, AGE, AND NUMBER OF SKATERS. *All basic skills and non-test skaters ages 12 and under. Skaters should be comfortable with forward and backwards crossovers. *All basic skills and non-test skaters ages 12 and older. Skaters should be comfortable with forward and backwards crossovers. *All skaters who have passed their Pre-Preliminary Moves in the Field Test and are under age 12, with the majority under 10 years of age. *Skaters who have passed their Pre Juvenile Moves in the Field Test. The majority of the skaters must be under 12 years of age. *Skaters who have passed their Pre-Juvenile Moves in the Field Test or higher and are under 20 years of age. ​*Skaters who have passed their Juvenile Moves in the Field Test. Must be under 13 years of age. *All skaters who have passed their Intermediate Moves in the Field Test. Skaters must be under 18 years of age. ​*Skaters must be under 16 years of age, with the exception that less than half of the skaters may be 16 or 17. Skaters must have passed their Novice Moves in the Field. *Skaters who are 13 years of age or older, but under the age of 19. Skaters must have passed their Novice Moves in the Field. *Skaters must be 15 years of age or older. Skaters must have passed their Junior Moves in the Field or Adult equivalent. *Majority of skaters who are 19 and older. Skaters must have passed their Juvenile Moves in the Field or Adult equivalent. *All skaters who are 21 or older, with the exception that 4 skaters can be between 18, 19, or 20. Skaters must have passed their Novice Moves in the Field or Adult equivalent. *All skaters must be over 21 and the majority must be over 30. There is no Moves in the Field requirements but skaters are encouraged to be taking private or group lessons.